Even though this stew simmers for hours in the slow cooker, it takes just minutes to prepare. 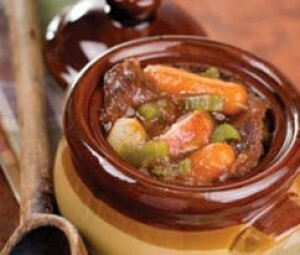 Filled with lean stew meat, baby carrots, mushrooms, and petite peas, it’s the perfect dish to start in your crockpot in the morning and have ready for dinner when you return at night. To fun it up, consider serving it in bread bowls. SPECIAL OFFER: SchoolFamily.com readers can purchase No Whine With Dinner at 30 percent off the list price, and get free shipping, by ordering the book here and using this promo code: FS2011. Place the mushrooms in a 5- or 6-quart slow cooker. Top with the stew meat and carrots. In a bowl, mix together the tomato sauce, maple syrup, vinegar, and salt and pour evenly over the meat and vegetables. Cover and cook on low until the meat and carrots are tender, 6-7 hours. When done, maintain the slow cooker on low heat. In a bowl, whisk together the cornstarch and water until well blended. Gently stir the cornstarch mixture and the peas into the slow cooker and cover until the liquid thickens and the peas heat through, about 5 minutes. Serve.